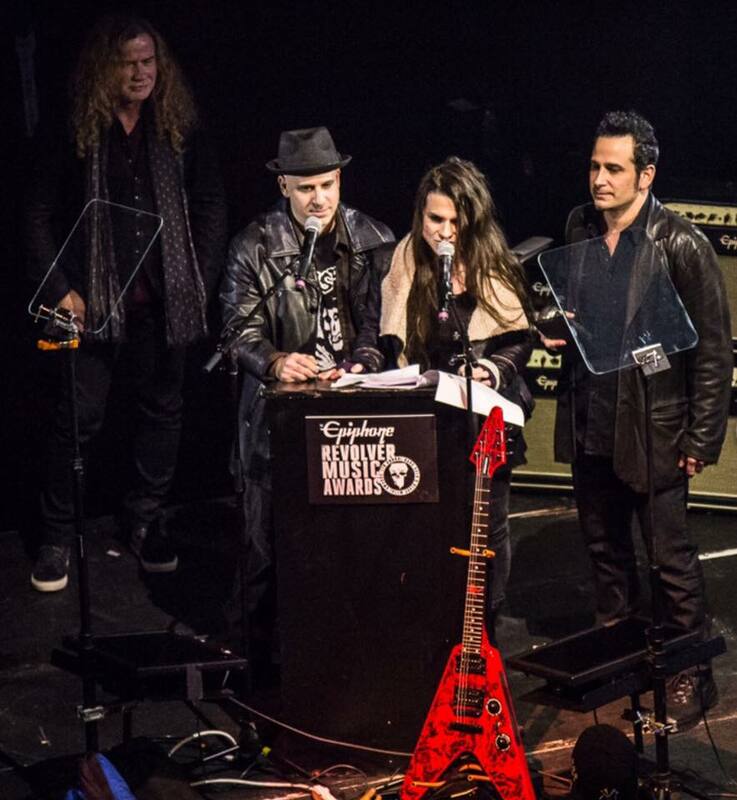 Life of Agony 's Alan Robert, Mina Caputo, and Joey Z. presented the Dimebag Darrell Best Guitarist Award to Megadeth's Dave Mustaine at the Revolver Music Awards in New York City on December 13th, 2016. The Walking Dead's Norman Reedus (pictured) was also on hand as a presenter. Watch the award show, here: https://youtu.be/aWDRs2sujpI (skip to 1:43 to see Life of Agony presenting the award). Life of Agony is currently wrapping up production on its highly anticipated new studio album "A Place Where There's No More Pain" (Napalm Records), due in early 2017. This November and December, the group heads over to Europe for a full headlining tour, but before they do, LOA bassist/songwriter Alan Robert sets out to support the release of his best-selling, horror-themed adult coloring book at several events this October. Tuesday, October 4th: The Beauty of Horror: A GOREgeous Coloring Book hits stores in the USA! “The Beauty of Horror” was called by The Nerdist “delightfully macabre.” His video teaser, “Inside the Beauty of Horror,” continues to generate more and more attention for the book. “I wanted to make the ultimate horror coloring book. If there was a book that I, as a horror fan, wanted to buy, this would be it,” he said. [vimeo 176340332 w=640 h=360] The Beauty of Horror: A GOREgeous Coloring Book from Alan Robert on Vimeo. From the twisted mind of Life of Agony’s Alan Robert (Killogy, Crawl to Me, Wire Hangers), his highly anticipated horror-themed coloring book for adults The Beauty of Horror: A GOREgeous Coloring Book will see an October release from IDW Publishing. "Bookstores are filled with coloring books for adults, but there’s a huge void for the kind of creepy art that horror fans like me want to color, so I decided to create my own," Robert explains. "The world needs a book like this to cut through the mandalas! It’s art therapy for the abnormal…and trust me, there are plenty of us." Rolling Stone: The Most Anticipated Metal Albums of 2016 - Life of Agony's "A Place Where There's No More Pain"
Award-winning executive producer/writer Rodney Barnes (The Boondocks, Everybody Hates Chris) has joined forces with Robert to develop an animated television series based on Killogy. Barnes and Robert will serve as executive producers on the series, with Barnes penning the screenplay for the pilot episode. Celebrities Frank Vincent, Marky Ramone and Brea Grant, who all appeared in the Killogy graphic novel, will now lend their voices to the show. Producers Chris White (My Super Psycho Sweet 16 franchise) and Jeff Mazzola (Descent) are also on board. "I'm happy to see the worlds Alan has created extend into new areas beyond comics," said Chris Ryall, IDW's Chief Creative Office/Editor-in-Chief. "His comic books are so visually intriguing and the characters he's created so fully formed that they'll translate really well into animation and other areas. But I'm also glad that he's still doing more comics, and the Killogy one-shot sounds like a perfectly dark treat for Halloween, too." 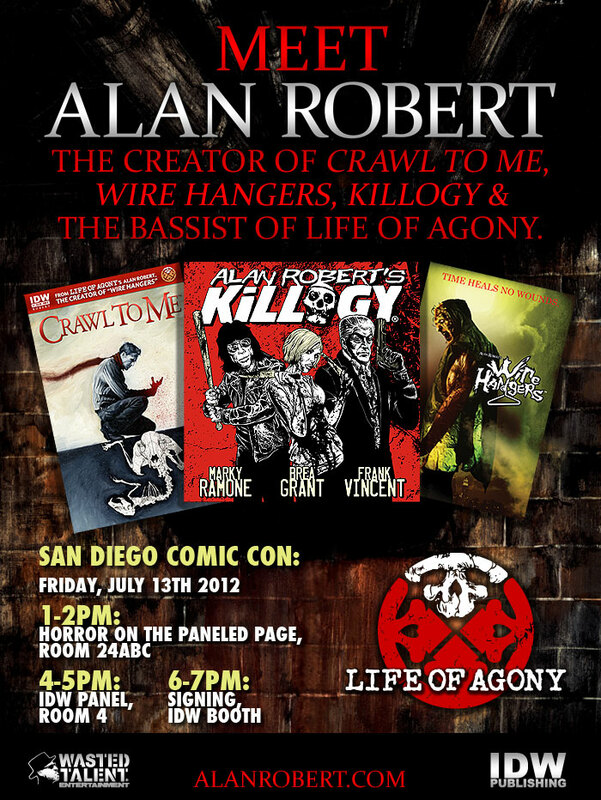 Alan Robert, bassist / songwriter for the band Life of Agony and the creator of critically acclaimed horror comic series Killogy, Crawl to Me, and Wire Hangers, is a guest and speaker at New York Comic Con 2013. Swing by Artist Alley (Table #BB18) to get your books or 'Life of Agony' memorabilia signed absolutely free! Alan will also be accepting commission requests for the first time ever. Email guybannister@gmail.com to get your requests in prior to the show as spots will fill up quickly. Also catch Alan on two Thursday (10/10/13) panels: Protect and Publish It: Room #1A03 (3-4pm, and 4:15-5:15pm). Visit AlanRobert.com for more details! 2013 Calendar of Horrors: Alan Robert Previews the Fright Flicks Coming Out This Year! "Crawl to Me" is a critically acclaimed and award winning graphic novel written and illustrated by Alan Robert (Killogy, Wire Hangers). This psychological thriller is currently in development to become a full-length, live action feature film with a screenplay written by TJ Cimfel and David White. IDW Limited (http://www.idwlimited.com) proudly presents two limited edition books: The Red Label book is hand-signed by Alan Robert and comes with a hardcover artist's portfolio containing a sketch from Alan, finished with expert gray wash and fine pencil. The Black Label edition is hand-signed by Alan Robert and comes with a full-color illustration by him. Visit http://www.idwlimited.com for more information. IDW Limited is pleased to announce a special new limited edition hardcover of Alan Robert’s Crawl To Me. From rock star to all-star comic creator, Life of Agony’s Alan Robert brings intensity and electricity to everything he does. This critically acclaimed, award-winning mini-series will be presented in a custom case and cover, with hand-drawn artwork by the book’s creator and artist. Presented in the multi-tiered IDW Limited fashion, fans will be able to select the level of original artwork and casing they’d like to purchase according to their budget and desire. Crawl To Me is both written and illustrated by Robert, with a beautifully painted dust jacket by artist menton3 of Monocyte fame. It’s part psychological thriller and part haunted house story. Ain’t it Cool News praised it as being “Gorgeous and terrifying,” while Fangoria raved, “Readers will be blown away by the story and art of this psychological thriller.” Crawl To Me was awarded Best Mini-Series of the Year by ComicMonsters.com and Hollywood is already taking notice. Crawl To Me is currently in development to become a live-action feature film, with a screenplay penned by screenwriters T.J Cimfel and David White. Alan Robert is a man of many talents, and they are fully on display in the pages of Crawl To Me. The book is available for pre-order immediately on www.idwlimited.com with a ship date of mid-November. Alan Robert Joins AOL's Noisecreep as Horror Columnist! Noisecreep is honored to have Life of Agony and horror comics creator Alan Robert join our family! Starting with this piece, he'll be contributing a column he's dubbed Alan Robert's Severed Heads. In the column, you can expect buckets of blood, tons of gore and everything else from the horror realm! 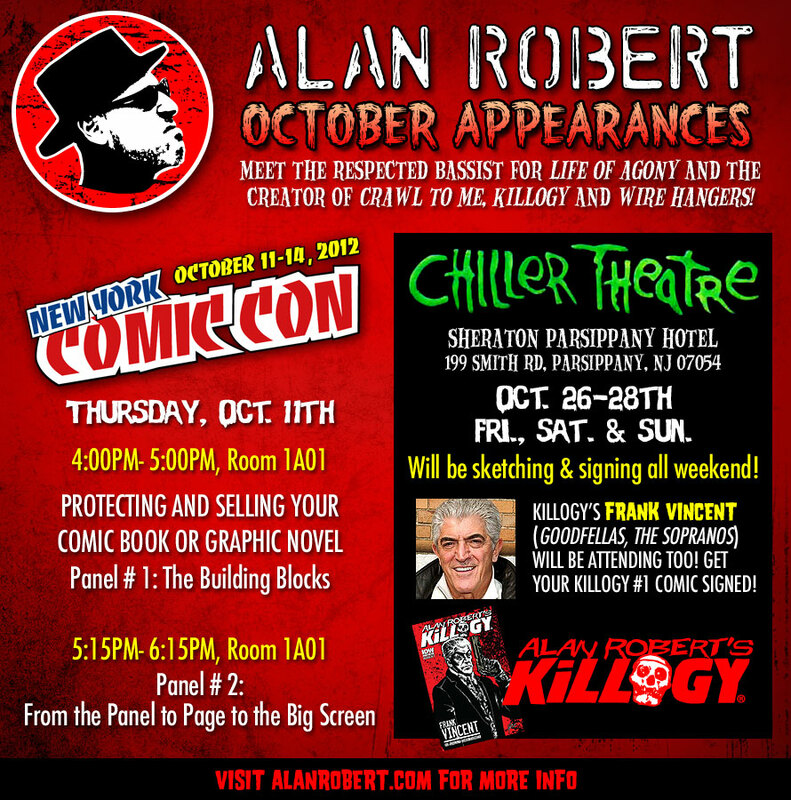 Alan Robert's October Appearances: Meet the Creator of Crawl to Me and Killogy! Meet Comic Creator/Musician, Alan Robert, at San Diego Comic Con!